Are you looking to whiten your teeth? Do you live in Orange Park or a surrounding community? At the dental office of Matthew Nawrocki DMD, MS, we are dedicated to assisting you with many different cosmetic dentistry procedures. 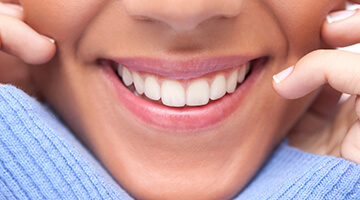 The health and longevity of your teeth and gums are our priority. With that said, we understand how important esthetics are to some. When asked, many people have reported that the smile is what they notice first when meeting someone. Tooth whitening can be a quick and inexpensive major change to the appearance of your smile. Whitening generally refers to the removal of stains and debris that accumulate on the teeth from normal aging, food and drinks, tobacco, or trauma related cracks. There are many different ways to whiten with some more effective than others. Staining can basically be broken down into two types of stains, either extrinsic or intrinsic. Extrinsic stains: Extrinsic stains are those that have formed on the outer layers of the tooth surface. Causes of extrinsic stains can be attributed to some staining beverages like grape juice, wine, or coffee and tobacco products. Many of these stains can be difficult to remove with normal brushing and flossing. Whitening can be extremely beneficial for these situations. Trauma is a common cause. If there is an injury that results in a fracture in the tooth structure, debris can become lodged there and make the tooth appear dark. Acids in certain drinks will wear away tooth enamel, making teeth appear yellowed. Others will stain teeth the same way they stain clothes by darkening the natural pigments. Intrinsic stains: Intrinsic stains, by contrast, can be more resistant to whitening than extrinsic stains. This type of staining can be the result of fracture, antibiotics, routine wear and tear or aging, or excessive systemic fluoride intake during dental development. Although much intrinsic staining can be more resistant to whitening procedures, often these procedures can be surprisingly effective. Some teeth are more susceptible to staining. Teeth that are lacking in mineralization are more permeable and darken easier. Our teeth all vary in terms of the thickness of enamel. Those of us with less enamel will have teeth that appear yellower due to the darker dentin layer of teeth that shows through thinning enamel. Our dentist will fabricate a clear application tray that is specific to your teeth. This is possibly the greatest difference between the over the counter products and the professional whitening systems. This allows for a uniform amount of product to reach all areas of the teeth. The whitening gel is then placed in the trays for a specified period of time. Results can take days to weeks to be observed. This is a long term solution, but because of the same reasons discussed above, teeth will eventually discolor slightly and a touch up may need to be done periodically. While take home trays are a terrific option for some patients, the truth is not everyone is willing to use the trays for the specified time. If these trays are not worn, there will be no results. For some, whitening in one visit with Opalescence Boost is the perfect answer. Generally, Opalescence Boost delivers results in less than an hour. It does so with a prescription strength whitening formula chemically activated and under the supervision of your dentist. This system can be used to treat the entire mouth, one tooth, or even a single section of a tooth. Perfect for the person that requires instant results or has a special event in the immediate future. Results are often attained in less than one hour.